The American Kennel Club describes the Golden Retriever as one of America’s most popular dog breeds. They say it’s friendly, intelligent and devoted. These qualities make it perfect for search and rescue work, as a guide dog and when not working, as your family pet. Keep your Golden Retriever happy and healthy with high-quality food. Read on for the top options for best dog food for Golden Retrievers. 2 What Does Your Golden Retriever Need? These suggestions are nutritionally right for your Golden Retriever. Of course, the best brand of dog food for Golden Retriever puppies and dogs is the one they love to eat. Try out these tasty options. This quality food gives your dog the taste of buffalo meat. In fact, it’s top ingredient is buffalo meat that’s been de-boned. Your getting 70% meat protein and no grain. Some dogs can have an intolerance for grain. If that’s your dog then this is the food for them. A grain-free recipe means no grain allergies or intolerance problems. It’s got the vitamins and minerals your Goldie needs. Especially important are the ingredients that help develop strong, healthy joints. It’s packed with Omega 3 and 6, Glucosamine and Chondroitin. Here’s a dog food made specifically with Golden Retrievers in mind. If you’re searching for the best dog food for golden retriever puppy dogs, this could be it. This product’s top ingredient is brown rice. It contains EPA and DHA as well as other essential nutrients. EPA and DHA are Omega 3 fatty acids. These fatty acids are important for your Goldie’s bones, bowel, brain, skin, heart, and lungs. Here’s a varied diet all in one dog food. This product contains duck, chicken, and lamb too. Add to that whole eggs and cheese and you have a tasty protein-packed punch. This balanced large breed food also contains pearl barley and oatmeal. There are all the essential fatty acids, prebiotics and probiotics that your dog needs for a healthy gut. Cartledge is added for healthy bones and joints. Here’s a grain free dog food for a Goldie with a taste for gourmet foods. Smoked salmon gives it a distinctive character. Salmon is the number one ingredient. 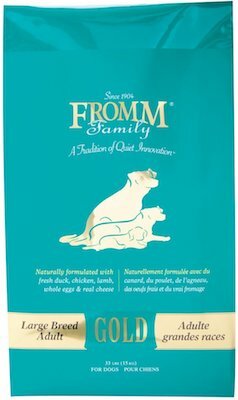 If your dog is egg intolerant than this may be their food of choice. All the animal protein comes from fish. That means omega fatty acids for healthy skin, bones, gut and more. And don’t worry about the salmon stocks being depleted. All the salmon is from a sustainable source. Perhaps you’re concerned that your Golden Retriever has allergies to certain foods but you don’t know what foods. Here’s the solution: Natural Balance Limited Ingredient foods allow you to eliminate certain foods from your dog’s diet while still giving them what they need to be healthy. The sweet potato and fish formulation is grain free and has a limited list of proteins. This formulation contains salmon and Menhaden fish meal. The sweet potato is easy to digest and it also has all the right vitamins and minerals. Here’s a high protein food that is also low in carbohydrates. Your adult Golden Retriever has to be careful not to put on too much weight. They can enjoy the delicious duck with chicken and turkey meal without the carbs of some other foods. The complex carbohydrates are supplied by sweet potato, oatmeal, and potatoes. You know blueberries, cranberries and carrots are great antioxidants. Your dog benefits from them too. Blue Buffalo also makes the best dog food for senior golden retrievers. Lamb’s the top ingredient in this dry dog food. This meat protein helps build and maintains muscle. There is also added calcium for healthy bones. With fiber from natural beet pulp and probiotics, it’s great for promoting good digestion. The Eukanuba range contains naturally sourced glucosamine and chondroitin to maintain joints. This freeze-dried food is actually raw. You add water to re-hydrate it. If you want your Golden Retriever to eat raw food without the hassle of buying and keeping raw meat, try it. It’s 77% beef. The rest includes organic fruit and vegetables. Use it as your Goldie’s main food or even as treats. This special food has kibbles made for puppies. The size, texture, and shape are adapted to suit your pup. Even the formula is designed to meet your pup’s need to build up their immune system and intestinal health. Used this food for Golden Retriever puppies from 8 weeks but not after 15 months old. After that, they’re ready to move on to richer food. This is definitely in the running for best dog food for golden retriever puppies. This grain-free formulation for puppies features deboned chicken and chicken and fish meal. It’s a puppy friendly recipe. It includes fatty acids to help cognitive and retinal development. What Does Your Golden Retriever Need? Caring for a dog is a big responsibility. They depend on you for all their needs. When choosing food for your Golden Retriever, look for higher protein and lower fat formulations. Animal protein is best as it contains amino acids that your dog needs. Nutrients such as calcium and phosphorus are key for puppies and vitamin B, A, and E for all life stages. Look for EPA, ALA, and DHA as these are helpful for the brain and nervous system, heart and lungs and the immune system. Golden Retrievers tend to have problems with their joints. Chondroitin and glucosamine are often recommended as beneficial for healthy joints. As in humans, digestion and the immune system are helped by adding probiotics to the diet. Deciding how much to feed your Golden Retriever is difficult. Start with a guide to the calorie needs of your dog. Next, it’s down to experience and monitoring your dog’s weight, health, and condition. Once you have selected the right food for your dog, it’s also important to have the right feeding routine. Puppies need mother’s milk, or puppy milk replacement if it’s not available. After 5 weeks add a solid food but only one that is designed with puppies in mind. Feed your puppy 4 times each day until 2 or 3 months old. Switch to 3 times a day and then when it’s 4 months old switch to twice a day. Stick to twice a day from then onwards. Sticking to a routine will help your dog’s digestion and behavior. Golden Retrievers have some health risks. They can have cancers of the blood and lymphatic system. Good nutrition can help reduce the likelihood of this disease. Narrowing of the aortic valve restricting blood flow and causing congestion of the heart with blood is another risk for your Golden Retriever. Fiber and omega fatty acids are beneficial for prevention. An underactive thyroid problem can cause unaccountable weight gain. This may not respond to reducing your golden retriever’s calorie intake. Get veterinary advice but more EPA, DHA, fiber, ALA, and probiotics can all help. Hip and elbow joints are a relatively common problem in golden retrievers. Look for added phosphorus, calcium, glucosamine, and chondroitin in dog food to promote healthy joints. Overweight dogs are also more likely to suffer from these problems. Watch the calorie intake. Eye complaints such as cataracts and central progressive retinal atrophy are not uncommon. Look for vitamin A and DHA in dog foods. Golden Retrievers are fun-filled, active dogs so you want that they are the right dog for you. They fit in with a family well and love life. They were originally bred as a sporting breed and their needs for exercise relate to this. A dog to retrieve game for hunters in Scotland needed to be tough and energetic. There’s plenty of wet boggy country in Scotland so being comfortable with getting wet and dirty was a must. Any Golden Retriever owner will know that. The Golden Retriever has the genetics for this physically demanding life and so needs exercise that replicates that. Your dog will have an appetite for food that supplies the calories for an energetic life. Without expending the calories by exercising they will become obese and badly behaved. Vary the activity between walking, running and fetching a ball. Even an occasional swim will be appreciated by your Golden Retriever. A regular activity of about an hour, twice a day is a good place to start. More exercise would be better still. The best dog food for Golden Retrievers is no good without the right exercise regime.